Have you ever heard of active listening? In short, it means that rather than passively sitting back and simply letting someone else talk while waiting for your chance to speak, you engage in the conversation without words. It requires full concentration, understanding, and recollection of the conversation. It helps to minimize confusion and forgetfulness. I employ these same practices when I read. I am an active reader. I interact with the book. I underline and highlight. I fold page corners or have tabs sticking out of the side. I argue with the text, challenging the author, editorializing or asking questions in the margins, sometimes writing so much it encircles the page. This isn’t unusual. Stanley Kubrick’s notes inside The Shining is just one example of famous writers marking up the texts of other authors. All of this is called marginalia and it’s one of the many reasons I prefer actual, physical books. I do have a Kindle and I do use it, but conversing with the text is much more difficult, from highlighting pages to making notes, especially since my fat fingers usually make the pages jump. Pen and paper is so much easier. I employ this strategy for every single nonfiction book I encounter, but not usually for novels and short stories (maybe that explains my shortcomings as a fiction writer). Still, every so often something in one of those books will strike me and I’ll mark it, but that’s far more rare. This is a relatively new endeavor for me and, truth be told, I wish I would have adopted it years ago. Aside from textbooks, I was loathe to mark up my books. I wanted to keep them pristine. For a time, I tried not to even break the spine or otherwise betray that it had ever been opened. As someone that has long been a collector, I wanted to keep my books as close to mint condition as possible. But to what end? What was my ultimate goal? Was I more concerned with reading the books or the appearance of them? If I just wanted them for their looks, I could buy a painting of a bookshelf and hang that up. Still, the first time you take a pen to a beautiful page of a new book it can feel like cutting up a Monet with a boxcutter, so if you don’t think you can bring yourself to mark up your books, I suggest you take a cue from my good friend who spent more than a decade collecting Jordans. He saw them as an investment, so he always purchased them with their value and ROI in mind, keeping them unblemished. But he’s also human and every so often a pair would be released that he desperately wanted to wear, not just stack for a rainy day. Yet he didn’t want to risk his investment. So what did he do? He’d buy two pairs — one to wear, one to preserve. 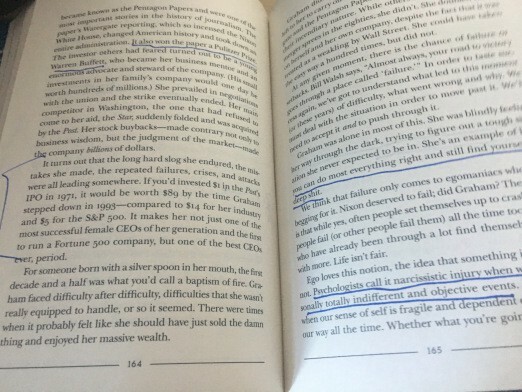 If you’re determined to keep your books immaculate, I’d suggest you do the same — buy a second copy that you can mark up as you wish. If that’s too expensive for you, buy your fresh copy new and then buy a used book, either from a fantastic indie bookstore or online at Thriftbooks, that you can deface with abandon. So, go forth and mark up your books. After all, being well-read and able to speak about the great books you’ve encountered is far more important than having your bookshelf look like an untouched Barnes & Noble. Christopher Pierznik is the author of nine books, all of which are available in paperback and Kindle. In addition to his own site, his work has appeared on XXL, Cuepoint, Business Insider, The Cauldron, Hip Hop Golden Age, and many more. Follow him on Facebook or Twitter.